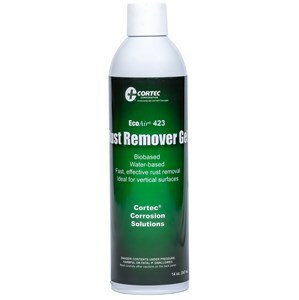 The Cortec EcoAir VpCI-423 is a non-toxic, non-polluting organic rust and stain remover. Multimetal protection. Nonflammable, extinguises fire! 14 oz. Spraying in any direction, even upside down. No product contamination by propellant. Safer to ship and store, with very low or no environmental impact. Cortec EcoAir products do not contain propellants, CFCs or HCFCs that affect the atmosphere, ozone layer or environment. When possible, EcoSpray products are formulated with ingredients rated for their biodegradability and non-polluting characteristics, minimizing waste disposal. EcoSpray products have no storage or added fire insurance restrictions. They can be stored like any non-aerosol lubricant or cleaner at room temperature. Do not let product freeze. EcoSpray products have been specially formulated to improve safety for the consumer as well as the environment. The products do not contain 1,1,1 trichloroethane, methylene chloride or chlorinated solvents. EcoSpray products are packaged in recyclable aluminum cans.